Gunnar has a home! 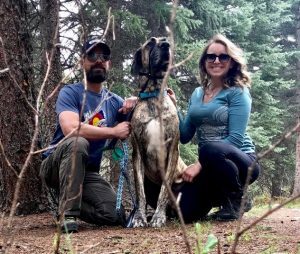 - Rocky Mountain Great Dane Rescue, Inc.
Gunnar has a home with his forever family, Jon and Lauren, in CO! Jon has owned Danes previously, and has helped his Mom with some behaviorally challenged Danes she was fostering in Texas. He was looking for a Dane that needed a special home, and one that maybe wasn’t a good fit for every family. That is when he spotted Gunnar on our website. He put in an application specifically for Gunnar, and wanted to learn more about him. Gunnar is a sweet family dog, but has some challenges with meeting new people and dogs. Jon and his girlfriend, Lauren, were smitten after meeting Gunnar and spending the day with him to learn what his exact needs were. They felt that they could provide Gunnar with the special home he needed, and were willing to work on providing him with they type of environment he could thrive in. He will be the only pet in the home, and will enjoy a hike now and then on a quiet trail, as well as camping trips, and four wheel excursions. Jon & Lauren are going to be working with a trainer for Gunnar to help with his introductions, and are committed to giving him the best life full of love and patience! We are so happy for Gunnar and his new family!